How to write “expensive” “tall” “highschool” etc.. in Japanese? How to write “expensive” “tall” “high school” etc.. in Japanese? Over 40 students are already signing up for N5 preparation course! LIVE-lesson has finished already but you can still watch our videos and download materials. JLPT N4 preparation course so far! We are doing the LIVE-lesson right now. (7/22-9/24) We just started! If you are interested, please don’t miss this chance! 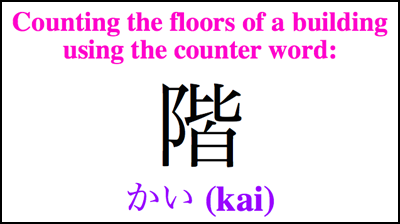 ★ The Japanese word for the first floor is １階 (いっかい – ikkai). 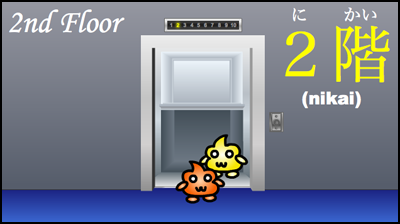 ★ The Japanese word for the second floor is２階 (にかい – nikai). ★ The Japanese word for the third floor is ３階 (さんかい – sankai). ★ Another way to say the third floor in Japanese is ３階 (さんがい – sangai). ★ The Japanese word for the fourth floor is ４階 (よんかい – yonkai). ★ The Japanese word for the fifth floor is ５階 (ごかい – gokai). 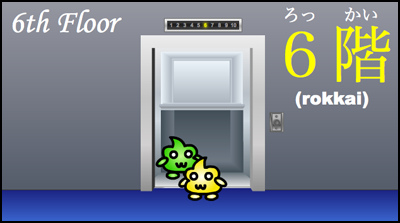 ★ The Japanese word for the sixth floor is ６階 (ろっかい – rokkai). ★ The Japanese word for the seventh floor is ７階 (ななかい – nanakai). ★ The Japanese word for the eighth floor is ８階 (はちかい – hachikai). ★ Another way to say the eighth floor in Japanese is ８階 (はっかい – hakkai). ★ The Japanese word for the ninth floor is ９階 (きゅうかい – kyuukai). 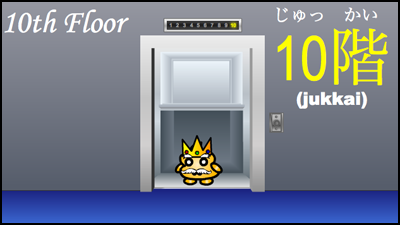 ★ The Japanese word for the tenth floor is １０階 (じゅっかい – jukkai).